Installation view of Il Lee at The Vilcek Foundation, New York, 2008. Art Projects International is pleased to announce that the Vilcek Foundation will present an exhibition of recent works by Il Lee, a Korean-born New York artist, who is best known for his historically grounded and innovative ballpoint pen works on paper and canvas. Lee’s unprecedented work with its unorthodox media and distinctive dynamic style clearly references traditional Asian ink painting while remaining accessible and conceptually rigorous. Lee’s understated approach is at once new and an expansion of the language of modernism. 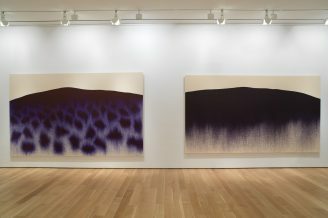 In 2007, Il Lee’s work was the subject of a critically- acclaimed mid-career retrospective at the San Jose Museum of Art and a solo exhibition at the Queens Museum of Art, New York. The exhibition celebrates the inaugural opening of the Vilcek Foundation’s new headquarters and cultural center located at 167 East 73rd Street in New York City and will be on view from June 2 to August 22, 2008. The Vilcek Foundation honors foreign-born scholars and artists living in the United States who have made outstanding contributions to society.